Unlike the early exemplary role playing or the traditional turn-based strategy titles of the same franchise, Might and Magic: Clash of Heroes (Ubisoft, Capybara Games, 2011) stands out as a distinguishable spin-off which combines match-three battle puzzles, strategic role playing and fantasy adventure gameplay together (Todd, 2011). The recurring theme of the game is heroes’ conflicts in a fairy-tale-like version of fantasy world Ashan, a full-realised secondary world with inner consistency of fantasy-oriented reality (Tolkien, 2001: 71), contributed by the gameplay, aesthetics, graphic/ audio styles and the typical good-versus-evil story, which all revolve around this theme from the very beginning, conveying a meaningful gaming experience to the player. The single player game begins with a cut-scene introducing the general background story of the five factions in Ashan with a history of demons invading the other four. As the narrator implies, the story of the game centres on the Blade of Binding—the plot device of the game and the demons’ covetousness for it is the source of the conflicts in this story. The real adventure (campaign) unfolds thereafter with a brief tutorial on the gameplay. Figure 1. A scene from the prologue of Might and Magic: Clash of Heroes (Ubisoft, Capybara Games, 2011), showing the start of the adventure. The gameplay consists of two major parts: the adventure and the battle within it, with role-playing making up essential experience in both. The adventure is the medium that carries the theme and drives the game flow, in which the player plays the five protagonists to experience the game in ways of immersive storytelling and gameplay elements of fantasy adventure genre such as exploring, accomplishing quests, hero development, resource collecting, army management, engaging in the inclusive puzzle-form battles, etc. The player’s gameplay experience starts with Anwen, the elven huntress and her first few non-optional dialogues and adventure moves (see Figure 1). Notably, the finite routes which adopt the movement nodes in the adventure scenes confine the player’s exploration; nevertheless the limitation doesn’t reduce the player’s view on the whole adventure scene and also channels the player more into the highlighted story of the adventure rather than the exploration which in this particular story-driven world is less emphasised. Therefore, the game is mainly a game of progression (story-driven adventure) with certain emergent play (choice of quests and strategies in hero development and battles) (Juul, 2002). Before further adventure is on, the player is confronted with the first battle in the game. Figure 2. 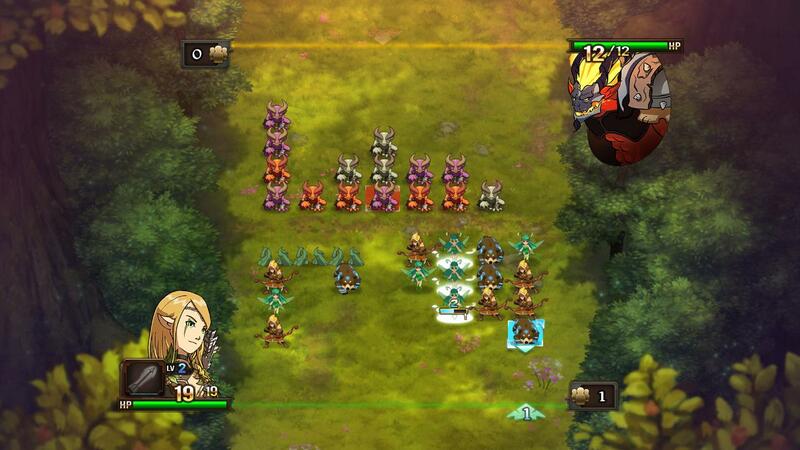 A battle scene from Chapter 1 of Might and Magic: Clash of Heroes (Ubisoft, Capybara Games, 2011). The turn-based puzzle-form battle is the process of resolving the conflicts between two rival heroes (see Figure 2) and is encounter during the adventure. Based on variations of match-three puzzles, the battle requires the player to form offensive (vertical stack) and defensive (horizontal row) formations of troops by removing any unit or moving the unit at the bottom of a column in limited moves in each turn. To win a battle and then proceed to further adventure, the player must defeat the opponent’s defences and inflict damage directly to the opponent’s heath until it is reduced to zero. The puzzle form of the battle abstracts battle strategies from reality to create a unique combat system that accords with the fairy-tale theme, lessening the intensity. By gradually introducing combat rules such as same-colour attacking chain and fusion, more combat units, Anwen’s spell and bonus moves rewarded by completing multiple actions in one move, the battle starts to involve certain depth of strategies which also increases in complexity and difficulty as the adventure progresses. In the meantime, the player learns as he/she plays Anwen in a reasonably progressive learning curve, practicing new skills and being rewarded by achieving new goals (Sweetser, P. and Wyeth, P., 2005). However, to some degree the randomness of the positions the troops spawn renders the battle a bit more relying on luck as the complexity of the battle rises and decreases the player’s sense of choice and agency; but meanwhile the randomness also results in the variety of the battle, enhancing the player’s feeling about the impact of the decisions on the game’s outcome (Salen, K. and Zimmerman, E., 2004: 174), here, through the process of resolving the conflicts. Heroes play a very important role in the battle because they are the actors of the conflicts and specifically the player can utilise their special attacking and defending abilities along with various battle bonuses provided by artefacts equipped by heroes to alter the strategies and even the whole battle. From battle to adventure and then to another battle, the player plays through the recurring process of the encountering and resolving of conflicts, in which the hero as well as the combat units gains experience points while the player becomes more experienced with the battle puzzles. Therefore, through the puzzle form of battles and the role-playing as heroes that engaged in them, the player experiences heroes’ conflicts in an active way. Figure 3. 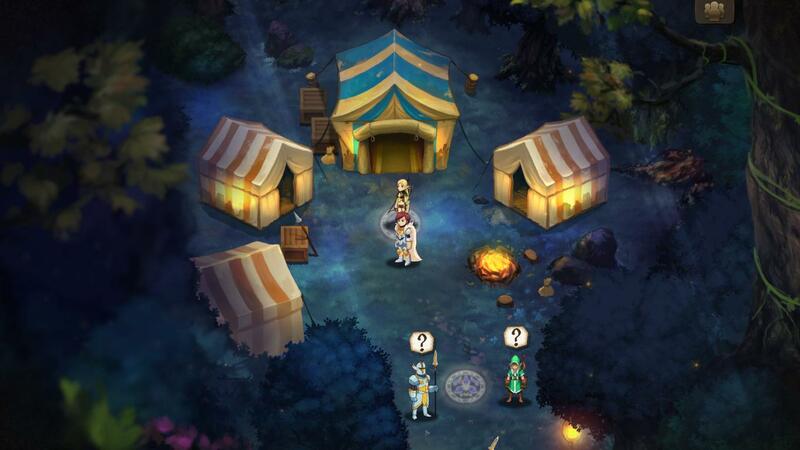 A cut-scene from the prologue of Might and Magic: Clash of Heroes (Ubisoft, Capybara Games, 2011), showing the protagonists being separated by the magic portal. The overall fairy-tale-like cartoonish graphic style of the game is in accordance with its expression of violence of the conflicts in a non-violent way for its intended wide, especially young target audience since the game was rated as E10+ (Everyone 10 and older) (ESRB, 2011) and PEGI 12 (PEGI, 2011). From the title scene on, the game is presented in a visual style of relatively small scale, smooth texture, and mild colour palette achieved using cartoonish rendering techniques with soft lighting and simple shadows. In the prologue and the first chapter specifically, the adventure scene is set in a mysterious and harmonious elven forest where little golden magic sparks float in the air and exquisite tents are set up among lush trees, depicting a typical territory of elves (see Figure 1). Characters, their dialogue avatars and combat units all appear as hand-drawn fairy-tale-like cartoon figures while in the static cut-scenes they and the adventure scenes remain the same style but appear in different perspectives (see Figure 3). These visuals differentiate from those of Heroes of Might and Magic V (Ubisoft, Nival Interactive, 2006) from a more realistic version of Ashan. The game was designed to be immersive in a fantasy context as these graphic elements are still presented as explicit symbols with conventional links (Sebeok, 2001: 55) to the traditional western fantasy even though they are in cartoonish style. For instance, the delicately depicted forest scene (see Figure 1) indicates the good elves while the red burning skins are of the evil demons (see Figure 2). In contrast to the static adventure scene, the battle scene appears more dynamic as the actions of heroes and troops are expressed by using smooth and slightly exaggerated animations but the adventure and the battle are generally in consistency as the graphics of the battle environment are in accordance with the location where the battle takes place. The game’s audio as well is in a fantasty style. The incidental orchestral music tends to be non-diegetic so that the music functions more vividly. It can be divided into three categories: narrative (theme) music, scene music and battle music. Narrative music appears when critical plots occur as an essential part of the narration. For example in the prologue, when the inferno army launches the sneak attack on the elven camp, the music suddenly becomes intense to cohere with the sinister turn. The title music also is of this category for it acts as the heroic “overture” of the whole story. Scene music plays along with the player’s adventure and in the beginning of the prologue specifically, is a soothing forest nocturne that implicitly immerses the player in the harmonious ambience. The highlighted battle music creates the major tension for the battle, in spite of the relaxed atmosphere created by the cartoon graphic style. Apart from the music, the abundant sound effects permeate the game and contribute to the completeness of the game world. Above all, the audio and the graphics work together in constructing a convincible fairy-tale-like fantasy world where the player engages in conflicts as heroes with active immersion. In the aspect of story, the game is a prequel to Heroes of Might and Magic V (Ubisoft, Nival Interactive, 2006), which sets extra-diegetic narration (Wolf, 2001: 101) for players who are familiar with the latter. As mentioned above, the story begins because of the Blade of Binding and is supposed to be developed and resolved by it. Thus by setting the game’s action in a specific narrative context and by giving the player, through the protagonists, the motivation (the main quest), the secondary world gains diegetic depth and the meaning to play (Wolf, 2001: 101). 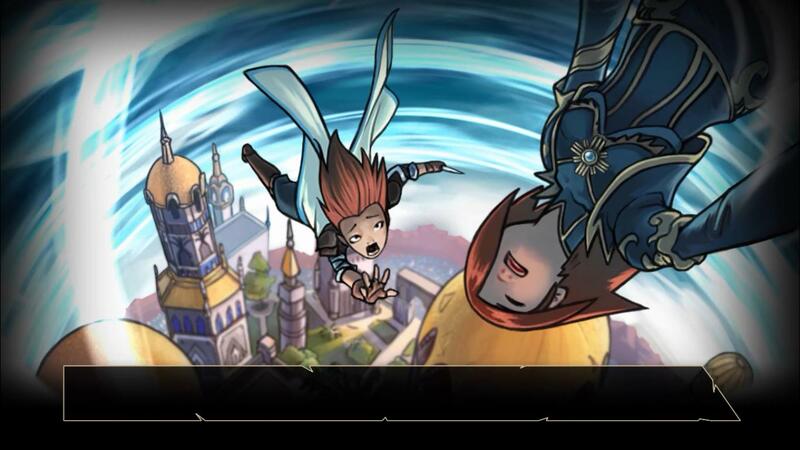 In the game, the narrative is conveyed mainly by characters’ dialogues, game plot and the cut-scenes. Being non-optional, the dialogues narrate the linear story in a most simple, direct and effective way and are mostly in approachable fairy-tale narrative form. While the cut-scenes seem to be non-interactive, they serve as narrative episodes for exposition, causation and tension (Newman, 2004: 98), linking the diegesis (narrative) and non-diegesis (gameplay). The plot in the prologue rises to the climax, as shown in the second cut-scene, when the camp is destroyed and nearly all heroes are defeated by the inferno army in search for the Blade of Binding, which sets up the major conflicts between the protagonists and the daemons that lead the overall storyline. Anwen and the other four orphaned protagonists then have to evacuate to the magic portal through tough fights and finally it comes to a temporary resolution that they get separated by the portal (see Figure 3). Scattered across Ashan, their fate will be totally different now and handed over to the player, together with the hook: the whereabouts of the other four and the Blade of Binding. Now, as the fairy-tale-like fantasy world Ashan and the on-going heroes’ conflicts are just beginning to unveil before the player, why would he/she click “Exit Game”? ESRB (2011) Might and Magic Clash Of Heroes Rating Information, [Online], Available: http://www.esrb.org/ratings/synopsis.jsp?Certificate=26953&Title=Might%20and%20Magic%20Clash%20Of%20Heroes [17 Oct 2012]. Juul, J. (2002) ‘The Open and the Closed: Game of emergence and games of progression’, Computer Games and Digital Cultures Conference Proceedings, Tampere, 323-329. PEGI (2011) Might and Magic Clash Of Heroes Rating Information Search Result, [Online], Available: http://www.pegi.info/en/index/global_id/505/?searchString=Clash+of+Heroes [17 Oct 2012]. Sweetser, P. and Wyeth, P. (2005) ‘GameFlow: a model for evaluating player enjoyment in games’, Computers in Entertainment (CIE) – Theoretical and Practical Computer Applications in Entertainment, vol. 3, no. 3, July, pp. 3-3. Todd, B. (2011) Might & Magic: Clash of Heroes Review, [Online], Available: http://uk.gamespot.com/might-and-magic-clash-of-heroes/reviews/might-and-magic-clash-of-heroes-review-6308736/ [17 Oct 2012]. Ubisoft, Capybara Games (2011) Might & Magic: Clash of Heroes. Ubisoft, Nival Interactive (2006) Heroes of Might and Magic V.
Wolf, M.J.P. (2001) ‘Narrative in the Video Game’, in Wolf, M.J.P. (ed.) The Medium of the Video Game, Austin: University of Texas Press, pp.93-111.